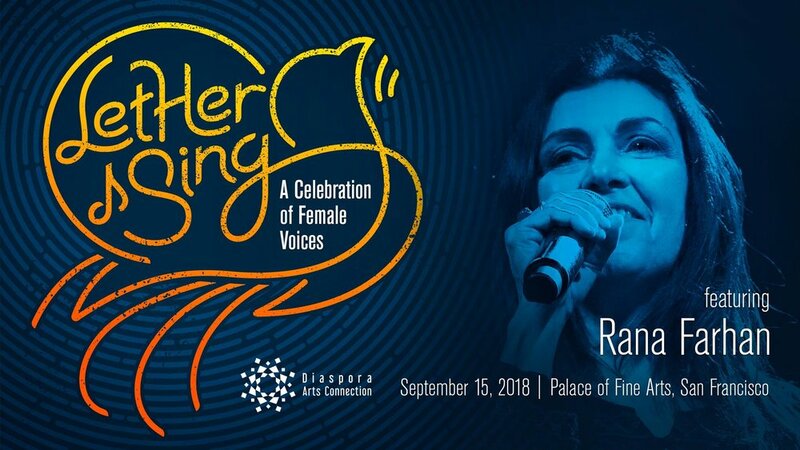 Back for its second year running, Let Her Sing celebrated female vocalists and musicians, too often deprived of the ability to express themselves artistically in some parts of the world. 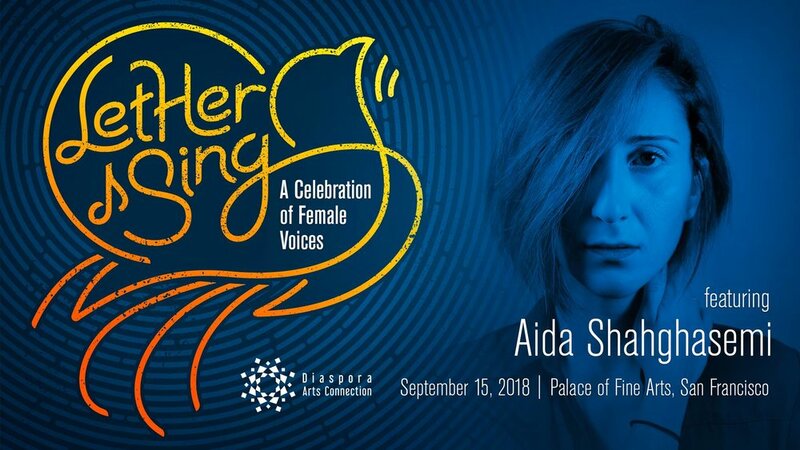 Dozens of female vocalists and a group of musicians came together on September 15 to celebrate the female voice; suppressed, censored, and threatened in some parts of the world. The 2018 lineup included: Mahdieh & Nasibeh Abdollahi (Avayeh Music), Rana Farhan, Helen, Aisan Hoss (dance), Jasmine Kara, Kitka Women's Vocal Ensemble, Samira Kharoubi, Ketevan Mindorashvili, Chloe Pourmorady, Aida Shahghasemi, Mahsa Vahdat, and Dina Zarif. We were more than proud to welcome back Erwin Khachikian as our Musical Director and Ana Bayat as MC. Artwork for this event was designed by Navid Ghaem Maghami. Check out the photos from last year and learn more about the event below! Mahdieh & Nasibeh Abdollahi (Avayeh Music) have been involved in professional vocals for the past 17 years. They both started their musical career in chorus groups in Tehran, such as Sharif University's Music Group and Tehran's Choir. For the following seven years, alongside teaching music to children, they were active members of the Iran's first Acapella group ”Tehran Vocal Ensemble” and in addition to seasonal concerts in Iran, participated in competitions around the globe, earning the following titles: Gold and silver medals in Asian Choir Games 2009, South Korea; three gold medals in Europe and Its Songs Festival in Spain in 2009; silver and bronze medals in World Choir Games in China in 2010; Silver medal in SEGHIZZI Festival in Italy in 2011; and with their quartet ensemble “Voria” earned Gold Diploma in World Choir Games in Cincinnati, USA in 2012.They were both part of first Acappella album published in Iran titled ''Vocapella'' on 2011. 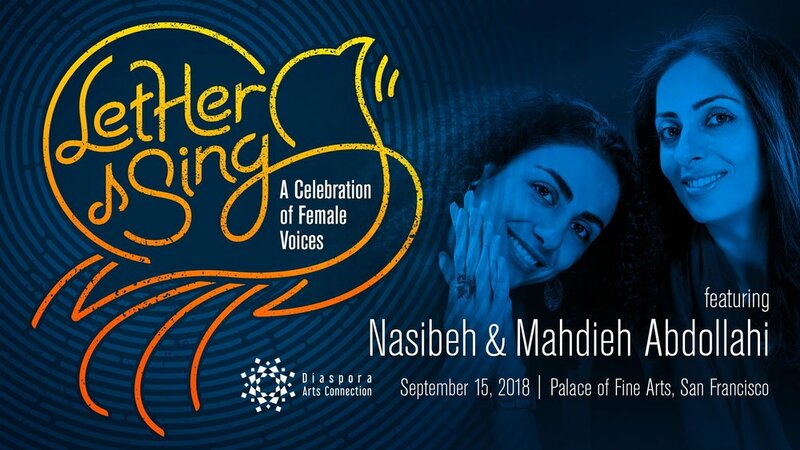 Nasibeh and Mahdieh received voice training from Shakeh Aghamal, Maryam Varzandeh, Azadeh Rezai, Narbeh Choolakian in Iran and Hasmik Hatsagortyan in Armenia. Since moving to USA in 2012 they have continually performed in concerts. Ana Bayat is the award-winning actress and playwright of the critically-acclaimed multilingual show Mimi's Suitcase Solo Show by Ana Bayat (“a hidden gem” and “pick of Fringe” at 70th Edinburgh Festival Fringe). Following in her father's footsteps, Ana trained in the Stanislavski system by studying with descendants of the master’s direct students before embarking for England where she underwent a rigorous conservatory training at Birmingham School of Speech and Dramatic Arts and obtained an M.A. in Film. Ana is thrilled to return to Let Her Sing as the storytelling Master of Ceremonies. Ana is fluent in five languages including Spanish, French, English, Persian and German and can next be seen in the feature film Waiting for Kiarostami. Aisan Hoss is a dancer and choreographer from Tehran, Iran. She started studying and performing Iranian dances at the age of twelve and teaching at the age of eighteen. While doing her BS in Business Management from Azad University in Tehran, Aisan attended a study-abroad English language program in London where she first encountered contemporary dance. She became drawn to the form’s unlimited possibilities for individual self expression and for experimentation of form and content. After graduating, she moved to London to pursue contemporary dance as her career. At Trinity Laban, she found her passion in choreography and dance pedagogy, which inspired her to spend one year teaching contemporary dance in Iran and to then pursue her MFA in Dance and Choreography at Mills College in Oakland, California. While at Mills, she received an Innovator Award sponsored by E.L. Wiegand Foundation. For Aisan, her passion in dance and choreography has been a means for gaining insight into her identity as an Iranian living outside of her home country. Aisan uses movement as a tool to find beauty in her history and identity. Inspired by modern Iranian culture, she aims to give voice to the quietest elements of her culture through choreography. "Rana Fahan grew up in Tehran, lives in New York, sings in Persian and English, sounds like Billie Holiday, adores blues and jazz, and is — in almost every other way — a unique cultural product of both her native Iran and her adopted country, the United States. No one else does what Farhan does on albums and in concerts: She combines the rich oral traditions of Persia with the rich oral traditions that originated in black, American culture. Farhan’s sultry, hybridized song book is a revelation to anyone who thinks they already know the full range of blues music." -Jonathan Curial KQED San Francisco. Erwin Khachikian is an experienced producer and musical director in the international and Iranian music scene. Born in Tehran and raised in the United States Erwin discovered his passion in the entertainment world from an early age. He has written, produced and toured with his own project KARMANDAN as well as many renowned artists of different genres. Samira Kharoubi is a Palestinian singer born and raised in Jerusalem. She developed her passion for music at an early age. She performes in local and international festivals around the globe. Samira's performance is inspired by classical Arabic music. Samira is a singer, a music teacher, and has previously worked as an occupational therapist. She has recently completed her Masters degree in international business. In 2018, Kitka featured special guest artist Ketevan Mindorashvili, Director of Georgia’s Zedashe Ensemble. Ketevan (Keto) was born in the historic Eastern Georgian fortress town of Sighnaghi and raised in a traditional singing family. Keto showed a gift for singing since childhood and continued to study music technique extensively in university. She devoted herself to preserving traditions on the brink of disappearance, and has become known as a singer and a teacher of Georgian folk music, particularly the fluid ornamentation of eastern folk songs. She has a deep knowledge of ancient church chant, and is a master of the panduri, the three-stringed lute from the eastern Georgian region of Kakheti. Keto has searched valleys and mountains for ancient polyphony, collecting folk songs and chants, as well as writing her own music within the tradition. Today she hosts students from all over the world in her native Sighnaghi and travels internationally leading tours of Zedashe and teaching workshops. Chloe Pourmorady is an award-winning Iranian-American composer, violinist, and vocalist based in Los Angeles CA. She writes music in a unique style influenced by rhythms and melodies from Middle Eastern, Balkan, Sephardic, classical, and avant-garde sensibilities. Together, Chloe and her ensemble promise a fresh, exhilarating experience in each performance and a vibrant new flavor to contemporary folk music. The ensemble for this concert will be made up of the unique talents of Alexander Meimand on Tar, Ramin Abrams on Bass, Sophie Poteratchi on Violin, and TJ Troy on Percussion. Mahsa Vahdat is a prominent performer of Persian vocal music and strong advocate of freedom of expression in music. Her career has given a deeper knowledge about Iranian poetry and music to large audiences in Europe, America, Asia, Oceania and Africa. Mahsa has developed her personal style based on the Persian vocal tradition of classical and regional folk music, but with a contemporary expression. She has always searched for ways to make her music relevant to the present world. Even if the origin of her styles is Iranian, she believes in her music’s ability to express a universal message of humanism and freedom. Her collaboration with musicians from Iran and many other parts of the world has contributed to the development of her personal expression. Mahsa was born October 29, 1973 in Tehran. She entered Tehran Arts University in 1993 and graduated with a B.A. in Music in 1995. Dina Zarif is a performer and vocalist who combines western classical singing with middle eastern styles inspired from her Persian roots to develop her unique sound. Since 2015, she has performed with her ensemble, Dina Zarif Ensemble, at various Bay area performing art centers and music festivals such as SF international Arts Festival and Yerba Buena Gardens Festival and alongside several world musicians. As an stage actress, she has performed in several productions of renowned Iranian stage and film director, Bahram Beyzaie, such as "Tarabnameh" and "Crossroads”. Her current project is curating “Music of the Banned” on different stages in reaction to the Travel Ban, aiming to highlight the music of the six banned Muslim countries. Dina is the Director of Programming at Red Poppy Art House in San Francisco. Many thanks to all of our sponsors and supporters.